A pay per click campaign can be a great way to attract customers willing to make purchases. However, just like any advertising campaign, you need a good strategy. At the same time, you need to manage the campaign in the proper manner so that it brings in the best result. You can make use of the following tips to ensure that your strategy is being managed in the proper manner. Unless you know the aims of the PPC campaign, you will not be able to manage in the proper manner. For that, you need to have a thorough understanding of your business and the products you are selling. The targeted customers also need to be taken into account. This step is essential as it will prevent you from using the wrong keywords. Otherwise, you will end up creating a campaign that does not bring in any customers. Instead, you will be losing a lot of money in the process. 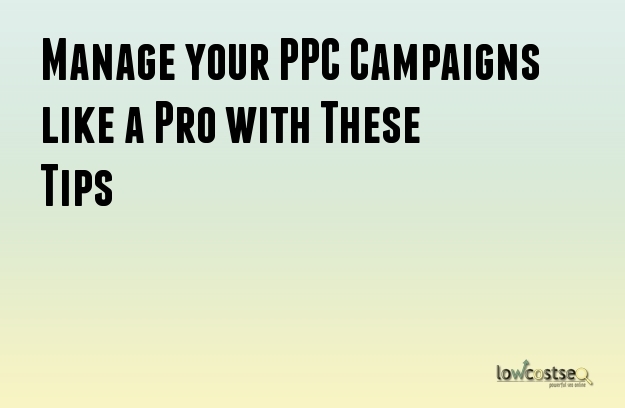 Define the goals of your PPC campaigns before you start running them. Plan the setup of your Google Adwords account in the proper manner. Improper accounts can end up harming your PPC campaign extensively in these ways. You can end up creating multiple campaigns to serve a single product or service category. There can also be multiple ad groups that end up targeting the same product. Keywords can also get duplicated in the same way for different ad groups and campaigns. Of course, you will find it difficult to keep track of the campaigns and measure their performance. There are many people who run PPC campaigns but do not track their results. This is an incorrect approach. Without conversion tracking, you will not be able to measure how effective your ads or your keywords actually are. It is important for you to know what resulted after your ad was clicked on by someone. If a conversion did occur, then you need to know which ad or keyword resulted in the sale. The insight to these metrics can be invaluable in improving the PPC campaign. You will be wasting a lot of money if you do not optimize the campaign settings. The settings should match the goals of your business. Check your campaign settings and ensure that they are optimized in the proper manner. Your campaign should be targeting specific audience. You need to ensure that the ads are targeting audience based on the correct languages, locations, devices and networks. Relevancy is the key to running a successful campaign. Your campaign should be using the correct ad scheduling and budget. Ensure that the bidding option is the correct one as well. Managing a pay per click advertising campaign may not be easy. Nonetheless, it is important to do so. You will be able to gain much better results by ensuring a proper management of the campaign. How to effectively use PPC Marketing to enhance your business? Pay per click is one of the most effective and low cost methods of bringing targeted traffic to your website. If it is done in the right way, people who are already looking for the type of products which your business is marketing will be inclined to clicking on your ads. These web visitors have better chances of converting and mostly lead to direct sales. If your PPC manager carries out the task the correct way, it is guaranteed that your ads will bring in paying customers who will bring in money for your businesses. The advert will need to be optimized for Bing/Google as this will help you compete for the top spot with other businesses in the similar industry or niche. Without doubt, PPC advertising can help take your business to the next level and it is one of the best and cost effective digital marketing tools available. When the PPC campaign is done well, your business is able to generate the best results quickly. This makes Pay per Click advertising a better way of advertising when compared to Search Engine Optimization (SEO). As soon as your adverts are activated, they will be displayed all over the web, bringing in global traffic (unless specified by your manager). A good PPC manager will ensure that your adverts have high quality scores with efficient bids, hence getting to the top positions of sponsored listings almost immediately. It offers quick results in special promotions, events, product launches, short-lived offers and other projects which require targeted traffic. Pay-per click can be the best way of promoting products or services where the manufacturer or the marketer wants as many people as possible to know about. Moreover, Pay per Click does better when promoting products in scenarios where a direct response is needed. There are many people out there who are actively involved in looking for certain products. It is these classes of people who can benefit from such adverts and who can bring your business the conversions as well as the sales which it requires to operate effectively. Moreover, you can promote your niche market keywords by using PPC ads. People who are looking for specific keywords and brands will definitely respond to well-targeted PPC ads. The most fantastic thing here is that the specific keyword phrases do not cost much in terms of bids. However, to create effective PPC ads, you should come up with attractive headlines, ensure that your keywords are included in your copy and split test several adverts. Vary the colors and sizes of the PPC ads and figure out how the targeted population will respond. In order to create a cost effective campaign, it takes creativity and research to generate highly sought-after keywords and key phrases. A lacklustre effort will be to bid for highly sought-after keywords/key phrases, which is a costly approach; a competent manager will get into the minds of your prospects and generate effective yet cheap keywords. Finding different permutations and combinations of search terms can substantially reduce your marketing costs, leaving you more funds to enhance other areas of your business. You may have already invested in SEO for your website. However, have you considered paying to get your services advertised on Google? Pay-per-click marketing campaigns are certainly a good way to bring in more customers to your site. In order to do so, you simply need to get yourself an account with Google AdWords. This is a highly detailed platform that has all the options required for an in-depth management of your PPC campaigns. Be that as it may, using it can be a bit confusing especially for those new to it. Here is a guide that can help you make sense of the platform and use it for your marketing success. You should certainly keep testing different ads so that you can find one that brings in the most results. Avoid restricting your search terms to a few. Use a mixture of terms instead. Using ad extensions can help you appear more professional. Don’t forget to keep a track of the activities of your customers. Use long-tail keywords as they are more effective in bringing in customers at a lower cost. Consistency in your ads is crucial if you want to avoid a high bounce rate. You should trial dynamic keywords. Don’t forget to keep tweaking and fine-tuning your website and ad campaigns. Make sure that the clicks are not wasted by ensuring relevancy between the ad and the landing page. Discover the key locations of your consumer base and use the information to improve your PPC campaigns. Research all avenues of ads such as display, video and mobile and invest in more than one of them. Find out the key demographics of your business and use this data to improve targeting. Use search words that lead to conversions so that the bounce rate can be minimized. Keep your forms short and simple. If the numbers are low, test out your theories instead of guessing at the source. Always make sure that you are following the best practice guidelines laid down by Google. Make sure that the loading times of your webpages are as low as possible. Use features that your competitors do not have in order to increase your traffic. Your website must be optimized for all devices. Check the landing page to ensure that it allows users to keep browsing without becoming too cluttered in the process. Make use of AdWords to create different ads for different devices. Include testimonials and reviews to build up trust. Decrease the number of clicks required during the conversion process. Create ads that target specific devices based on which device brings you most results. On the other hand, you should not neglect the audience that comes from mobile devices. Implement keywords in your URLs to boost the traffic. Your graphics should be relevant to the search query. There are certain features available in AdWords that are displayed in mobile devices such as call buttons. Ensure that these features are used.